This is about four guys who got together often to play bocce ball and had so much fun sharing food and wine afterwards that they started their own label. They began in a garage, found out they could make pretty good wine and took it from there. The biggest challenge was finding a name for their wines that wasn’t already taken. 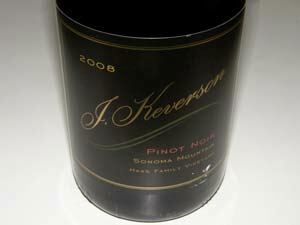 The result was J. Keverson, a figment of their imagination representing a combination of all of their names - John Hazlewood (winemaker), Kevin Tompkins, Scott Broome, and Eric Ulicny. Their first two releases, a 2005 Zinfandel and Sangiovese, were medal winners. A Russian River Valley Pinot Noir was released in 2006 from Labyrinth Vineyard.